There were still a few fleeting gloomy hours before the official sunrise . . . before Reveille roused the soldiers from their rest. Yet there was still plenty of activity around the scattered camps, even at this early hour. The sprawled cantonments of the Paneuropean's 11th Strike Division lay in a 7-kilometer radius all around the Mobile Command Headquarters, hidden well in the folds of these remote Galician highlands of northwestern Spain. The Headquarters Company of the 11th Division hummed with a constant buzz of incoming and outgoing transmissions. Reports were being steadily sifted and collated, mapping the scattered Combine forces lying in a patchwork jumble a hundred kilometers to the south, the hologram map tracking them all with bright colored points of light. All of them retreating. Watching this illuminated display, General Bellman of the Italian Army Staff was now de-facto Commander of the 11th Strike Division. He'd been in the big seat since last month when his own senior officer never made it out of a burning GEV. Bellman was tired. He ached all the time now, five months without relief, not even a week off. So many of his officers were gone. Yet the 11th had stood and fought. And it held. The Combine had been hurled back with horrendous losses and now he had some breathing space. It was a valuable pause to ratchet down the pace, get soldiers rested, and all remaining units rebuilt and re-equipped. He also now had a new asset, and he wasn't yet sure what to do with it. Would he even get to keep it? And that was why he was up an hour earlier than normal, awaiting the arrival of Major-General von Meyer. He wasn't surprised to get the order from Strasbourg that Meyer had been sent. After all, this new 'guest' was a surprise development, even in the hectic back-and-forth maelstrom of the Iberian campaign. 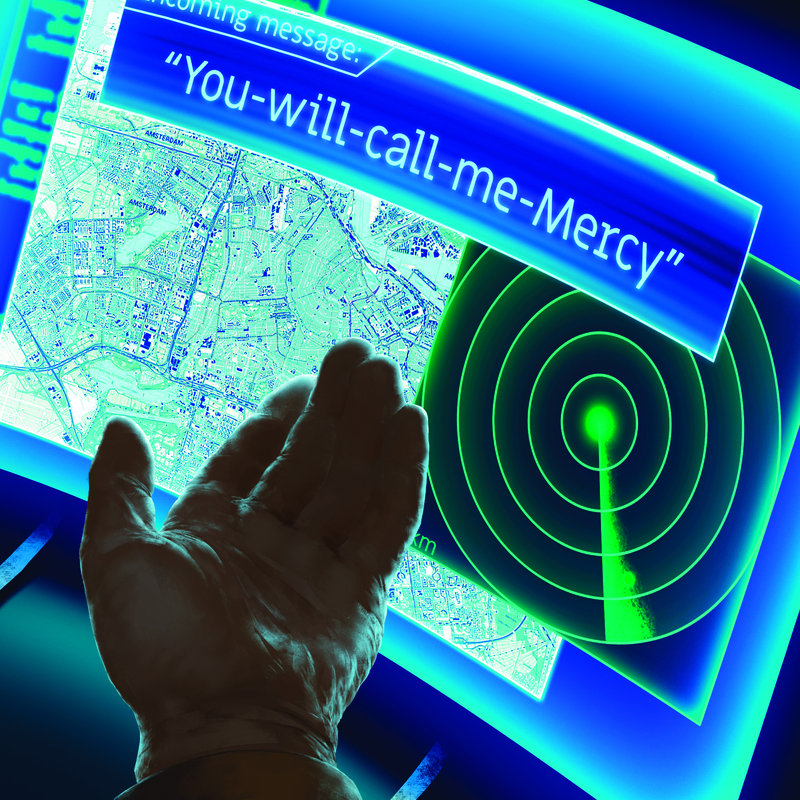 The latest ETA of 'Fixer' Meyer flashed up on one of the command prompt holoscreens, stating it was 'near-imminent'. Bellman slid back into the command chair to finish his coffee. 'Fixer' Meyer - one of the golden favorites of Paneuropean Supreme Headquarters. Renowned for rebuilding collapsed commands, gathering units into Kampfgruppen, sacking failed Generals, setting up Hedgehog defense-points. He was the Western defense's own Fireman - dynamic, successful, aggressive, ruthless. Bellman smiled. You don't scare me, Herr Meyer, he thought to himself. There was a slight early morning rain squall as Major-General Erik von Meyer arrived in the HQ compound. He jumped out of his GEV as soon as his pilot had cracked the door open, following hard on the heels of the escorting guards towards the MCHQ. So, this is the hub of the Fighting Eleventh - the Bloodied Sabers, he thought to himself. He looked up at a fluttering torn pennant. The off-white banner, once edged in gold lace, still had its proud crossed red sabers emblazoned upon it. He liked that; he had an appreciation of the old military heraldry, and it pleased him that this mixed division of Italian, Polish, Austrian, and Danish veterans still had pride in who they were. General Bellman watched a staff officer direct the Major-General into the Command Chamber, prompting him to slide out of his chair. He only then remembered he should have checked over his uniform, maybe changed into the spare tunic. He sighed; too late now, and after all, why worry? He secured an undone top button and left it at that. Exactly as he expected, the Major-General was the very epitome of the ultra-professional German High Command, smart and confident, and not a speck of Spanish dust on his uniform. Bellman made a half-hearted attempt at saluting — very deliberately. Meyer thanked the staff officer after handing her his long-coat and gloves. He glanced towards General Bellman. He didn't see a broken man, as some at the Strasbourg office had suggested. He saw a tired man, but a proud Italian commander - one who had allowed himself to relax in order to cope with what he'd achieved - a minor miracle of a victory despite the Combine onslaught. Meyer had a gift for sizing people up, an empathic skill for character assessment. He saw a good commander close to exhaustion, but this man was no failure or fool. Meyer nodded acceptance as the staff officer offered to arrange a welcoming morning coffee. There was a brief pause as the two generals stood motionless opposite each other. Meyer seized the moment, stepped forward and held out his hand, which Bellman shook, smiled, and offered his German counterpart a position over at the Main Command Desk. Bellman gave a very brief summary of 11th Division positions and status, knowing full well this was just introductory stuff. Meyer patiently listened, taking it all in, asking no questions. Bellman enjoyed playing out the briefing, delaying the inevitable, the actual reason why 'Fixer' Meyer was here. Finally, he directed Meyer's attention to the large green symbol parked just a few kilometers east from where they sat. It was motionless, and the holoscreen reeled text and chart reports from the sensor cameras and scanners that had been directed at their new arrival. Streams of data spread across the sub-screens as code-filters deciphered the incoming intel. A hazy visual image slowly pulled into focus, and Bellman slid the screenshot into the center of the display. Meyer was fixated on it, his cup of coffee now almost forgotten. "It really is a Mark 5?" He muttered this quietly, and Bellman nodded. Meyer had never been this close to one. He had never fought one. It was scarily imposing in size. It dwarfed the GEVs and Heavy Tanks parked close to it. This giant looked a little different from the usual lines of the Mark V design layouts, but the lack of detail in the image stopped him from seeing exactly what was different. But there was still no mistaking the silhouette of a Combine Mark V.
Bellman sharpened the image and switched to live-feed. Meyer now saw troops and vehicles slide slowly past, while the Ogre sat, still and silent. The early morning light was improving now, so Bellman dialed back the light-intensification. Now Meyer started to get a real appreciation of what was different with this Ogre. "No main batteries?" Meyer noted the complete absence of the paired heavy guns at the bow of the Mark V. Yet he looked closer he noted there was no obvious battle damage. Then he saw not only were the missile casements empty, most of the secondary batteries were missing too. He was back on his feet now, close to the holoscreen, rotating and zooming the live-feed himself, until he remembered his coffee and found it was stone-cold. He set the cup down disappointed and yet still completely distracted with what he was seeing, as Bellman summoned some more. And it was Bellman who decided it was the right time to start the anticipated discussion. "We removed all the ordnance - well, the 44th Polish Heavy Engineers Troop carried it out. All of it is on trains heading to Stuttgart now. The Research Command at Strasbourg sanctioned that." Bellman continued his narration as Meyer sat staring at the live-feed. "We've left some of the AP weapons, as we had difficulty removing them all. You'll see some additions fitted to the superstructure, and the tower has part-retracted. We fixed some of the more serious surface damage with BPC-grafting sets, but essentially - well, this Ogre is now ready." He waited for Meyer to take it all in. It was ready, and it could be underway in seconds, given any orders. But it was now effectively completely unarmed. "Protection capsules. We fashioned them from some evacuation pods taken from submarines laid up in Coruna harbor. The design was fabricated from materials we had on hand and the plans we were given." Bellman knew that last part would help him dodge the 'why' for a moment longer. "Who gave you the plans?" Meyer felt like he was back in Karlsruhe Military Academy, asking instructors where did the ammo go in a standard assault rifle. But at the same time, he knew this was different. This was unique. And Bellman knew they were getting closer to revealing it all now, and he thought he'd paced it slowly enough so that Meyer was now on the same wavelength. He'd need to be. The reality of the situation was so far-fetched, after all. To answer Meyer, he took a deep breath, exhaled slowly and pointed at the Ogre on the screen. Meyer stood up abruptly. He didn't know what to respond with first. Whether it was the Ogre's instruction to be disarmed and refitted with new equipment. Or that Bellman had just said "she." Or that Bellman delivered all of this with such a straight face; no smirks or smiles, just matter-of-fact and direct. "She? Are you trying to tell me, General, that this Ogre has a specific gender?" He slightly regretted resorting to rank, calling Bellman 'General', and he was already wishing he'd asked about the weapons stripping instead. Bellman just shrugged in reply, turned to the new platter of coffee, and helped himself. He motioned Meyer to return to his seat. Meyer complied; this was all most irregular. No wonder Supreme Headquarters had sent him to investigate Bellman's initial report. "This Ogre approached our lead defense line near Dormea and Sobrado just over two weeks back. We'd heard, of course, that a Mark V was in the area, over the Net. Those Spanish in 73rd Armor Brigade had run from it, despite this being their turf. So, we knew she - it - was approaching our Divisional area. I sent the Danish Mechanized Strike Group out to circle it, get behind it. Two of their GEVs strayed too close and the Ogre opened fire. Except . . . it was no kill-shot. Instead, it was a single AP round that pinged off the lead GEV's windscreen. Utterly harmless, and totally unexpected. And then she - it --stopped and just sat there, near Sendelle. And it started to talk to our sensors. It took us two hours to cross-reference and patch the language codes until we settled on what was being used; an early medieval dialect linked back to the Visigoths." Meyer was trying hard not to show how stunned he was by all the detail. He did his best to check back into some sort of conversation mode. "You say the Ogre did not attack our Danish GEVs, but instead halted, and started to talk to your battlefield sensor arrays in some ancient language? Bellman - these details weren't in the report you submitted. I'm finding it hard to . . . to understand . . ."
"It took a while for us to translate all of it, most of that first day, in fact, but we knew the back story by that evening. And then we talked. Overnight, we sent out a single hovertruck and the Ogre followed it into our cantonment, and parked where you see her now. That has been her resting place ever since. When she goes out, it's where she comes back to." Bellman had resigned himself to using the feminine tense now. He was slightly irritated in having to check his language all the time anyway. "So . . . what happened, and why do we now have a Combine Mark V in our camp?" Bellman took a long drain of coffee, then another deep breath, relaxed into his chair, and just decided to tell all. He had, after all, dodged the 'Why?' question for long enough. "The Ogre had been tasked by Combine-Iberia High Command to plough a wide lane of destruction all the way up the coast of Portugal and then along the Spanish northern coast. One-way attack, no going back. Maybe it was a desperate last order, who knows. And that's what she had done, very successfully. She single-handedly destroyed General Cheiman's Portuguese Defense Brigade, for instance. Then she broke into our defense zone and routed those guys in the 73rd. We had major problems of refugees all over the area, a lot of panic, all created by one Ogre. Thousands were fleeing eastwards and my troops were spending half their active duty time getting the civs out of harm's way." "Meanwhile, she pushed on north until she came to the Rio Ulla, just south of the city of Santiago de Compostela. But instead of encountering defense troops, she found a very large crowd of unarmed civilians, led by the mayor and some priests, waiting for her. Seems they were carrying all sorts of banners and paraphernalia from the Cathedral. Icons and items about their patron Saint James." Meyer was puzzled. "How large was this crowd?" "Over 33,000 people. Men, women, children; hell, they even turned up with horses and cattle. And pets. All civilian, all unarmed. Carrying their saintly icons . . . and singing." Meyer slid back into his chair, bemused. He could actually picture such a scene. And he noted his coffee was stone-cold, again. But he was too lost in Bellman's narrative to care much. "It seems they asked her to not attack them, they told her about their saint, and their city's history. She learned from them that they were not a military threat to either her or the Combine, I guess. They even recited prayers to her. Either way, she agreed to pass them by, and changed direction north-eastwards, missing out on Coruna, and resuming an eastward advance towards Oviedo. Except, she stopped a day later, and spent a day scrutinizing the data she had collected at Santiago. Somehow - I don't know myself - she found the operational code for the general attack order towards Santander and Bilbao . . . and she deleted it." "The next thing we knew, she was approaching us, and you know already how that turned out." Bellman gestured to the live-feed still visible on the main screen. It was a quite accurate summary of all that the Ogre had provided as explanation, to himself directly, when they had first talked together. Meyer, however, had never encountered anything like this. In fact, he'd never heard of anything like this, ever. And he had spent years travelling the globe for Paneuropean military interests. He was right in his first assessment; this was truly unique. "Are we saying, then, that this Ogre has defected . . . or surrendered to us? And you say it ordered you to remove the weaponry too? And then make alterations?" Meyer still found it strange to follow Bellman's lead and call it 'her'. But then, he consented to himself, Bellman had been dealing with it for a fortnight now. He also made a mental note to recommend Bellman for a week's leave. "No, she has insisted that is not the case. She's asked for neutral status, to be respected by all." "And have you agreed to that, have you promised her - it --that's OK?" Meyer could have kicked himself, slipping like that. He needed more coffee, so he headed for the pot on the serving tray. You could always rely on Italian commanders to ensure decent coffee was available. "Actually, we have. And so have the Combine commanders, too." Meyer spun back to face Bellman. "Really? I would have expected them to do everything and anything to get this Ogre back - or see it destroyed." "No. That's actually the next part of all this that you have to understand." Meyer returned to his chair, sensing all that he had heard so far was just the start. "All the modifications we have carried out are to serve one purpose: preserving human life. They were all done to her explicit instructions. Those top pods for example. Each one able to carry one suited-up medic. They eject from the chassis, equipped with the new battlesuit jump motors those Russians designed, reinforced for a safe landing. Capable of keeping a wounded trooper safe in medical stasis - two if you get out of their battlesuits. All that decking - anchor points set in them for securing more casualties. And the missile casements - you can squeeze more bodies in there. Stowage packs are fixed in various places, front and sides, all carrying a range of kit we've scrabbled together. Spare servo-motors for suits, helmet-plates, scrubbers and filters, tools, med-kits, food packs, water bottles, even the BPC-spray grafters for temporary patching. All quick release - in fact, some of those eject too with directional propellant charges. It took us three days to fit it all. And it all works." Bellman keyed in a stat-chart on the holodisplay. "Our newly neutral friend has carried out nine rescue sorties just in the last week, recovering 848 wounded Paneuropean personnel, with a post- rescue 72.5% survival rate. And - over 200 Combine personnel as well." Meyer crunched the numbers. That was worth a couple of battalions at other hotspots he'd fought in; the difference of a hastily made defense point falling or holding out. Plus, this adapted Mark V had rescued Combine soldiers, too. "And is that why the local Combine commanders have accepted the neutral status too?" "Si, Generale. Exactly. Three days back, we had a particularly vicious battle on the approach to Zamora. We all took heavy losses. Then she turned up and started the casualty extractions. When some Combine troopers were collected too, we saw the remaining Combine forces fall back 3 klicks. Turned out it was a mixed British and Canadian Battle Group. One of their officers came over, told us we could proceed without fear of them attacking. They were true to their word." "And where are the Combine casualties now?" "Treated, then processed as POWs, and now in a medical camp just east of Santander." "Well, 506 could have returned to active duty by tomorrow or the end of the week. But seeing as we have some peace and quiet here at this moment, I've ordered the medical staff to take their time." Meyer nodded. This entire situation was truly special, no doubt about that. For an Ogre to act this way? One from the Combine too. He was already drafting the initial outline of his report in his mind, but he knew this was going to be a tough challenge to make it convincing. Or simply believable. An Ogre had just never acted like this, ever. For Bellman this had played out as he had hoped. In truth, probably better that he had anticipated. Meyer hadn't scoffed - there had been no ridicule - and he hadn't been sacked. There was one last card to reveal, one last scene to show his guest. He motioned for Meyer to rejoin him at the main screen. "Shall we say 'hello'?" Bellman's fingers flickered over the holokeyboard and a message slowly assembled on a sub-screen, adjacent to the live- feed of the Ogre. - Good morning. It is Bellman. How are you? Meyer watched Bellman type, then glanced up at the live-feed. He thought he could see lights switch on, but he wasn't sure. More of their troops and light vehicles were moving around the camp now, seemingly oblivious to the giant machine, ignoring it as if it was just some normal building or bunker. - Good-morning-General-Bellman. Adequate-restoration. On-standby. Awaiting-updates. Meyer glanced at Bellman, seeing his Italian commander grinning, sipping more coffee. "It is time to introduce you Major-General, if you're happy to proceed?" Meyer just nodded. "Typing all this takes time, but bear in mind, our computers are trying to translate this all into that Visigoth dialect I mentioned, and when she replies, that has to be translated too. So, if there's a little bit of a delay, it's just processor lag." Bellman went back to doing his speedy four-finger keying. - I have a friend here. He wants to talk to you. His name is Major-General von Meyer. Meyer read the reply text at least three times. Mercy. It had given itself a name? And it was quite insistent it seemed. And he was now in a conversation with it. With her. Now he had a slight insight into why Bellman seemed so comfortable with its choice of gender. Bellman allowed him to take over the keyboard. - Hello Mercy. I am Meyer. I have so many questions to ask. I do not know where to begin. Bellman let out a laugh, patted Meyer on the back, and returned to his commander's chair. It was like someone taking your regulation backpack off for you; relief, relaxation, lightheaded, and then suddenly, really tired. He slumped into the worn upholstery, still grinning from ear to ear. - What question would that be, Mercy? Meyer looked back over his shoulder to Bellman. "If she suggests playing Poker - don't. I owe her two months of my pay already." Bellman laughed again, and this time Meyer laughed too. - OK, Mercy. Why have you decided to become neutral and to rescue wounded troops? Both men were now silent, looking at four words that seemed to blaze defiantly from the holoscreen. Four words that neither would have ever expected to hear from one of the most refined killing machines in military history. It was surreal. - So, you will now save lives, not take them? - That is good to know, Mercy. But in truth, throughout history, mankind has always found a way to carry on. Reading that last reply, Meyer felt a little chilled. 'For what is to come'. He stood and contemplated what to ask next without following the obvious lead, but the hook had been well planted within him. Just as he hovered over the keyboard, the text sub-screen blanked out. The conversation with Mercy was obviously now over. "We're still trying to instruct her on the simple manners of saying 'Ciao' when she finishes." Bellman indeed felt truly relieved at this point. He had nothing else to show, and he had no more he could tell Meyer. 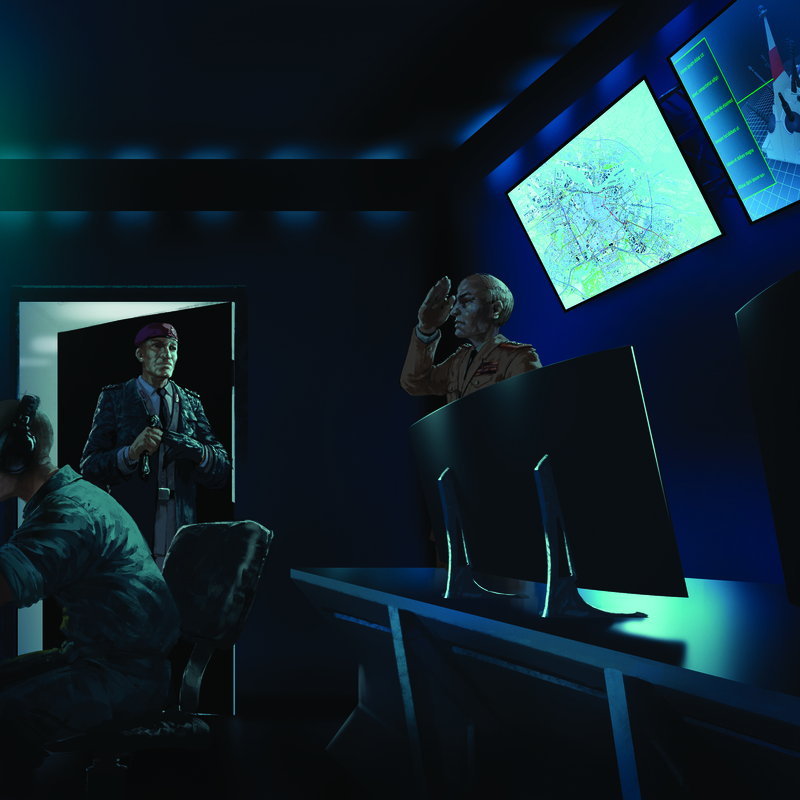 From this Command Chamber, Meyer should now be able to see it all for himself. "Why has she chosen 'Mercy' as a name? Is it some sort of special Combine medical code perhaps?" "No, nothing like that. It seems it was the first word she heard, spoken to her by those civilians of Santiago." Meyer nodded; he could accept that. It seemed to fit this strange occurrence perfectly, in fact. He returned to watch the live-feed from the sensors, and saw troops assembling, battlesuits being closed up, vehicle crews donning helmets and harness. As he watched, a line slowly assembled, a queue that slowly walked up to the Ogre as it sat motionless. Meyer looked on as one-by-one, each soldier laid a hand on a BPC panel on the track-housing, or on a tread, before moving off elsewhere. All of them did it, one after the other. Bellman watched Meyer's frown. "She retrieves them, so my soldiers think it is polite to do that - to tell her 'don't forget me' - before they head off for form-up." 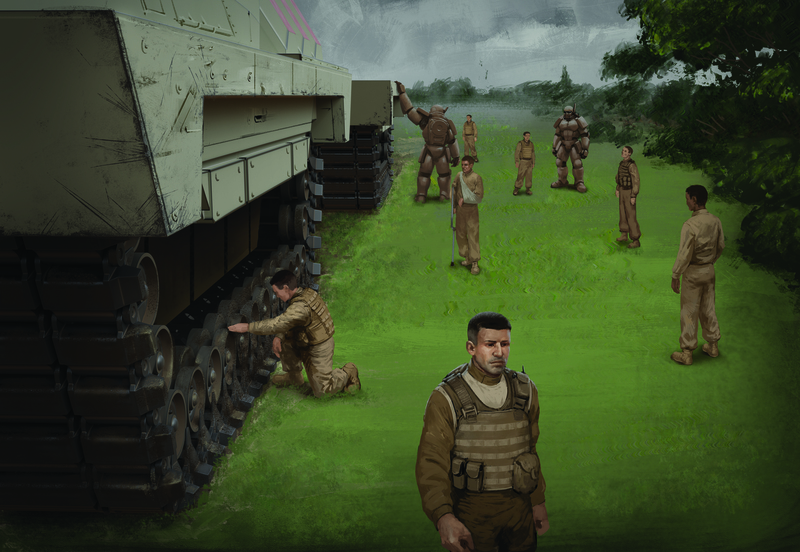 As Meyer looked on, while infantry and vehicle crews all followed each other with this early morning ritual, he wondered whether it was a superstition Bellman should have stopped. Any yet, he could strangely understand it. In this horrendous war of chaotic destruction on the battlefield, and for all the years it had been fought, to suddenly have something that could potentially offer salvation from all that hopelessness. More importantly, to have that here, next to you. He easily imagined that if he was still a young Leutnant in the LuftPanzers, no doubt he would have done the same. He settled back into the chair, watching the soldiers go past. And in the quiet Command Chamber, for a moment it seemed the War was on another continent, elsewhere. Bellman even found himself steadily and slowly dozing off. Many hours later, after Meyer had sent off a preliminary report back to Strasbourg, he sat alongside his GEV pilot, in silence, watching the French countryside fly past their windscreens. As they hurtled down the reserved center lane for military traffic on Euro-Autobahn-7, he noted nothing except the read-receipt of his submittal had not come back to him yet. He could picture it; Senior Commanders in Supreme Headquarters, sitting behind closed doors, discussing his findings. All trying to fathom out what was the best action. As if there was any feasible action that could be taken. A decision that 'Mercy' would accept and comply with. Meyer thought it was ludicrous to even try. He couldn't shake those last scenes from his mind, the long parade of troops, looking for hope from a machine. But worse were those worrying words etched into his memory for ever. "Humanity must be ready for what is to come." He wished he still had some of that Italian coffee on hand.